This minibeast was photographed by David Haines at Culkein Drumbeg on 17th May 2017, moving at speed on the road. 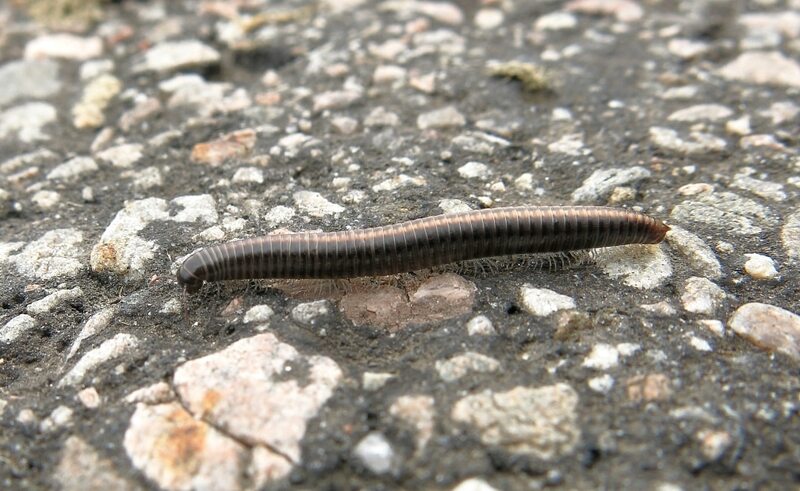 The cylindrical, armoured body and numerous legs (two to each segment) identify it immediately as a millipede. Precisely which species was more difficult to determine, but comparison with an excellent set of images on the NatureSpot web-site suggested the Striped Millipede Ommatoiulus sabulosus, and this was kindly confirmed by Paul Lee, the Millipede Recording Scheme Organiser. Two ginger stripes down its back readily identify O. sabulosus, which, at about an inch long, is one of the largest of over sixty species of millipede found in the British Isles. It is also one of the most widespread, with previous records from several places in Assynt. It seems to have a preference for areas on lighter soils, often near the coast, but adults wander widely in the summer and may then be found almost anywhere. A few years ago, huge numbers invaded gardens and houses further up the Sutherland coast at Oldshoremore.